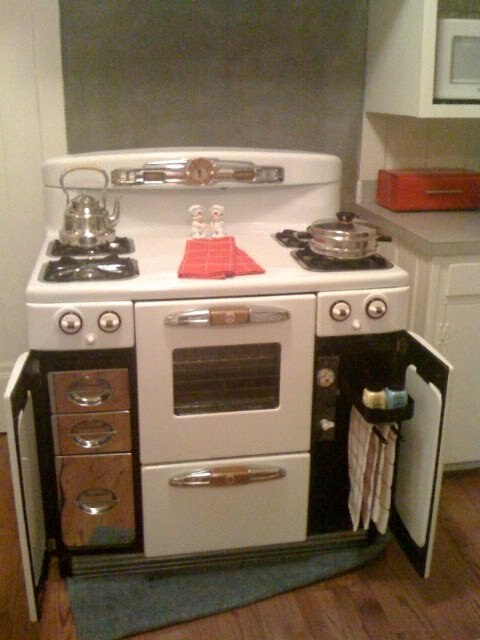 My heart skipped a beat when I saw the pictures of this stove. 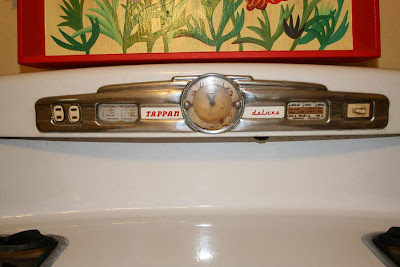 "My wife and I received a Tappan range from my grandmother that they bought in 1960. They only used it for 6 months before my grandfather was transferred overseas and then it sat in storage for 40 years! I have attached a picture of the stove and of the model number plate. The model number looks like OK 30-3. Didn't see any info for this model under the model info on the site. It has 4 top burners and griddle in the center. The oven thermostat is a Wilcolator." 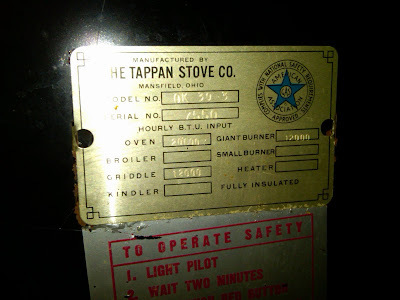 I have heard that the Tappan company was somehow affiliated with O'Keefe & Merrit for a short period of time and produced stoves. I strongly suspect this stove is one of those collaborations. It has all of the earmarks of an O'Keefe & Merrit stove (swoon). I think they used to call them "O'Tappan" stoves as a little joke. These photos are of June's Tappan Deluxe with a model number of TV-6219. 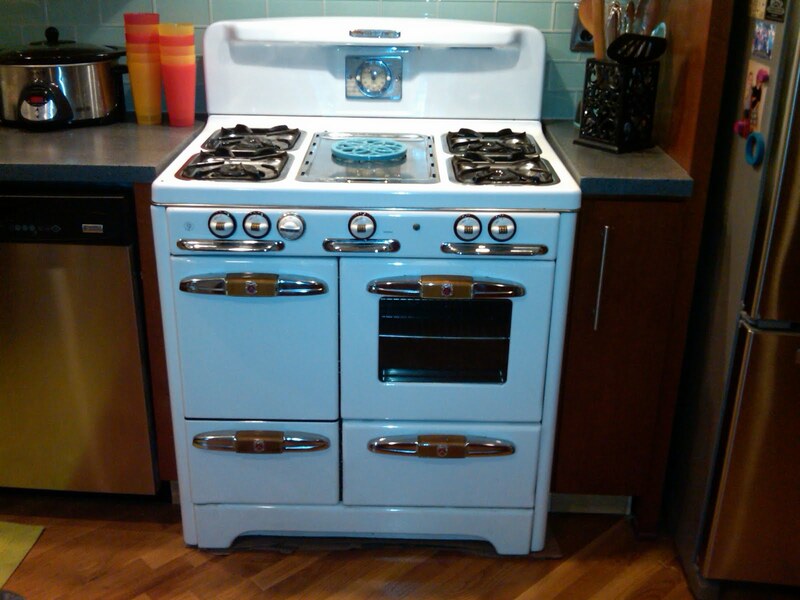 Her stove is original to her 1950's house and she is only the 3rd owner of the Tappan! June sent the photos with a few questions. She was hoping to discover what year her stove was manufactured; if the silver burner rings were original or if they once were glass; and what to use to clean the stove. My response to her included the following observations. I suspect the stove is a 1950's (or so) model. It has a knob turning on the back splash light instead of the earlier pull chain. The stoves are amazingly easy to clean. If you look on my blog, you will find pages on how to clean the burners..how to removed the manifolds to clean...how to clean the broiler, etc. I'm almost certain that the chrome rings are original to the stove. They were typical for your model. 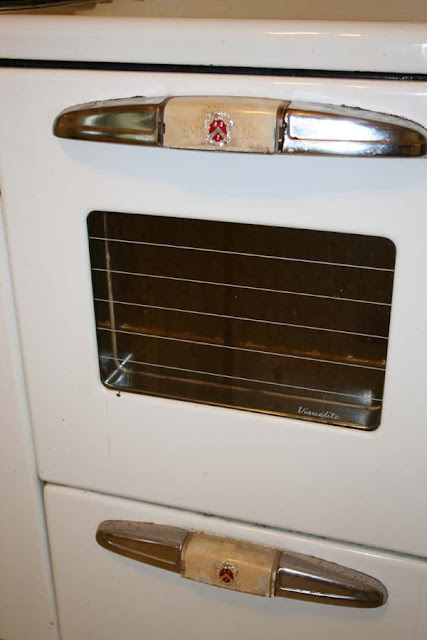 If a stove had glass rings, they would have little light bulbs behind the rings to light them up. I am very curious about the switch on the far right side of the back splash. What does it turn on? The oven? This is only the second stove I have seen with that feature. Okay Tappan Talk readers, now it's your turn. What feature do you see on June's stove? What cleaning tips do you have? Do you know what the switch on the back splash does? 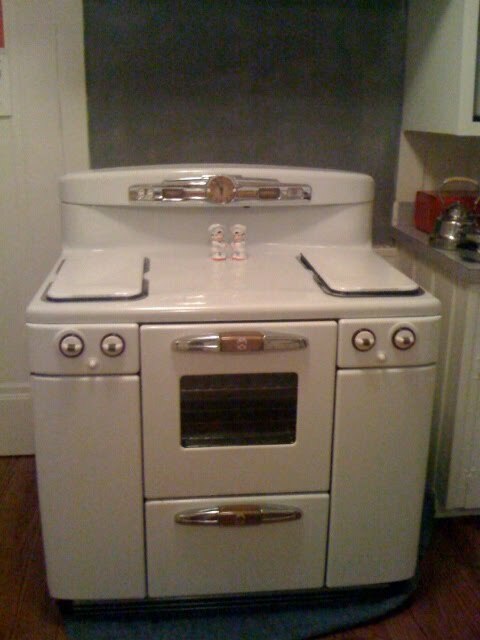 David sent me these photos of the Tappan wall oven that came with his new 1950's ranch house. 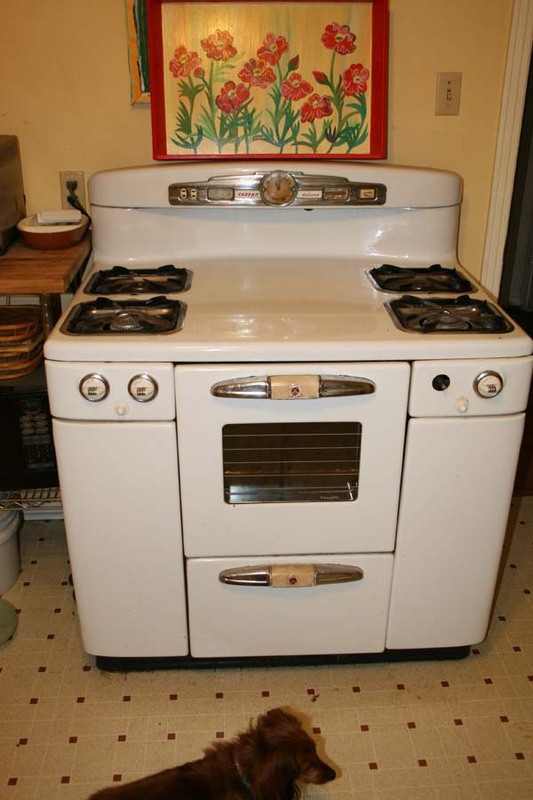 I don't have much information to provide about these great mid-century walls ovens other than to say that it was most likely original to the house and to find a ranch with it's original oven is a treat. If you peek at the hardware on the cabinets to the right of the oven, you see those oh-so-hot 1950's concave circle handles that are all the rage with the mid-century crowd. I love, love, love the control panel and the door handles. I'd be especially interested in learning more about the model names and model numbers. Here are a couple photos of Caitlin's new stove. Caitlin originally sent me an email trying to decide between two Tappan Deluxe stoves that she found for sale. 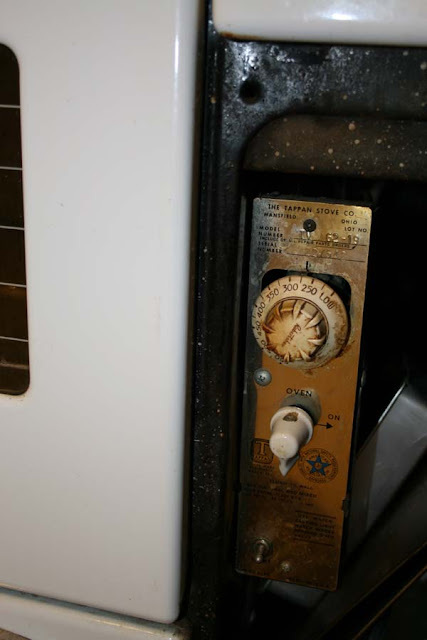 The discussion boiled down to.... "...what do you personally think would be cheaper to handle, a tappan that needs a new thermostat and has a gas leak in the line or a tappan whose pilot light and oven do not come on at all?" "Ok. keep in mind as you read this, I am NOT an appliance pro. So, take whatever I say with the appropriate skepticism and verify it with someone that knows stoves. Replacing the light bulbs on the burner lights is not a big deal. In fact, I posted instructions on my blog. Do a quick search and the pages of the Owner Manual that explain how to do it should come up. Also, look for a post entitled "Keeping it in the Family." Thermostats can be rebuilt. There are a number of companies out there that rebuild Robert Shaw thermostats (or sell replacements if the original can't be fixed). It is not cheap. If memory serves me I think it's in the $250-300 range. That said, if your thermostat is rebuilt you are set for a very long time. If the rest of the stove is in good condition, probably worth the expense. Thermostats can also be adjusted. It could be that this is all it would take. I have instructions on adjusting the thermostat on my blog (search the label "thermostat"). You can hand these off to a pro. A leak in the gas line would concern me. They can be tricky to find. I have read that mixing a soap & water mixture and putting it on suspected areas and watching for bubbles can help you find a leak (they also sell stuff for that). I'm not sure how you go about fixing a leak. If the gas smell only appears when you turn on the top burners, I would suspect the burner valves leaking (the piece behind the white knob). These can also be rebuilt/or regreased - you can have a pro do it or, you can buy the grease yourself ($20 or so) & it comes with instructions (from what I understand it's not very difficult). Or you could have an appliance person do this. This is a pretty common repair (and one I will be doing on one of my burner valves eventually). If the leak is on the manifold line, this might be a bigger deal....but that would stink even when the top burners are off because gas is always flowing to the burner pilots. One other thought it looking back over our past emails, is that the conversion to propane loosened something. It's my understanding that the conversion involves adjusting the burner valves. So, this kind of makes sense...and might be a good place to start. On the second stove. The oven pilot line can get clogged. There is a post (Tina's Stove) on my blog where the reader cleaned out her pilot tube and got her pilot to light (she provided a nice photo). I think rust & crud can get into the line. On the stove you are looking at, it sounds as if the top burners work fine, right (?) There is also a "mixer cap/burner spud" under the oven burner (where gas flows in). This adjusts the air/gas mixture. I have some info on adjusting this..and you can show it to an appliance repair person." "Just got the "new" Tappan Deluxe CP delivered today with all the bells and whistles (original S and P shakers too!) . I just need to figure out how to fix the light behind the second to right red burner ring and get the oven working, which from looking at it seems to be merely a blocked gas line (she got a new thermocouple and electric start in 1996 when it originally went out), let's hope. I'm making an appt. with a repair guy tomorrow who will most likely steal me blind, but such is life...."